Rosarios is a traditional Italian cafe run by Rosario and his great team. 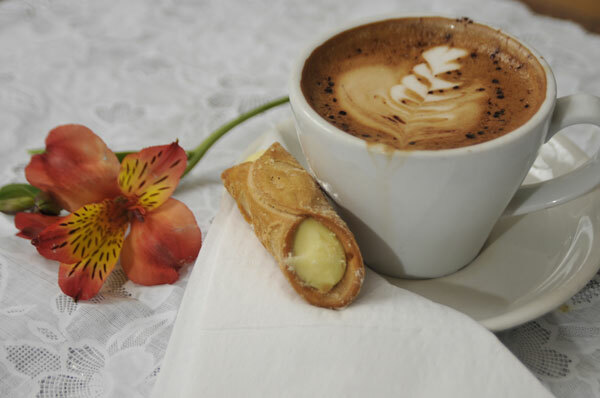 Rosario has poured his passion on both coffee and his nonna’s cooking into the concept of this curiously fabulous café. Customers and friends are invited to experience and enjoy a flavour of Italian style in the centre of Bath. Rosarios is located in a Grade II listed Georgian building and boasts a ground-floor counter serving fine Italian and home-made cakes, tables outside the shop for people watching, and some cosy upstairs seating looking down on the bustle of Bath's independent shops. The decoration of the shop is warm, stylish and quirky. Excellent table service is offered in the shop. Rosarios serves a full range of the finest quality leaf teas; we are famous for our unique, fresh, locally roasted coffees; we offer a large selection of quality soft drinks such as San Pellegrino, a range of our own home-made cakes, and a collection of imported Traditional Sicilian Cakes (Cannoli) and Pastries. Our home-made carrot cake, coffee and walnut cake, and a collection of Sicilian pastries are gluten-free. Our menus include a large selection of all-day breakfast dishes, daily specials (hot bowl of the day and home-made pasta dishes), and some great gluten-free dishes (our ingredients are mostly locally sourced to support local farmers and independent establishments). Additionally, lighter meal options include paninis, salads, homemade soup and sandwiches. You can also pick up a collection of carefully selected products such as our unique ground coffee (in retail package and for either espresso maker or cafetiere). You can also order in the shop for takeaway coffee, food, or cakes.